Inorganic chemistry, solid state and coordination chemistry of chalcogenide compounds. Design of new materials, exploratory synthesis, thermoelectric materials, nanostructured materials, intermetallics, mesoporous semiconductors, phase-change materials, conducting polymers, intercalation chemistry applications of new materials. “Photoluminescent Properties of Semiconducting Tl6I4Se ” N.K. Cho, J.A. Peters, Z. Liu, B.W. Wessels, S. Johnsen, M.G. Kanatzidis, J.H. Song, H. Jin and A. Freeman Semiconductor Science and Technology 2012, 27, 015016-1 to 015016-4. “All-Solid-State Dye-Sensitized Solar Cells with High Efficiency” I. Chung, B.Lee, J. He, R.P.H. Chang and M.G. 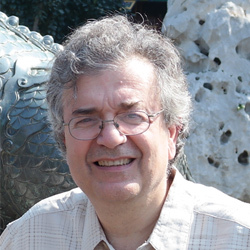 Kanatzidis Nature 2012, 485, 486-489. “Thermoelectrics with Earth Abundant Elements: High Performance p-type PbS Nanostructured with SrS and CaS” L.D. Zhao, J.Q. He, C.I. Wu, T.P. Hogan, X. Zhou, C. Uher, V.P. Dravid and M.G. Kanatzidis J. Am. Chem. Soc. 2012, 134 , 7902-7912. “Photocatalytic Hydrogen Evolution from FeMoS-Based Biomimetic Chalcogels” B.D. Yuhas, A.L. Smeigh, A.P. Douvalis, M.R. Wasielewski and M.G. Kanatzidis J. Am. Chem. Soc. 2012, 134, 10353-10356. “High-Performance Bulk Thermoelectrics with All-Scale Hierarchical Architectures K. Biswas, J.Q. He, I.D. Blum, I.W. Chun, T.P. Hogan, D.N. Seidman, V.P. Dravid and M.G. Kanatzidis Nature, 2012, 490, 414-418. “Raising the Thermoelectric Performance of p-Type PbS with Endotaxial Nanostructuring and Valence-Band Offset Engineering Using CdS and ZnS” L.Dong Zhao, J. He, S. Hao, C.I. Wu, T.P. Hogan, C. Wolverton, V.P. Dravid and M.G. Kanatzidis J. Am. Chem. Soc., 2012, 134, 16327–16336. “Molecular Germanium Selenophosphate Salts: Phase-Change Properties and Strong Second Harmonic Generation” C.D. Morris, I. Chung, S. Park, C.M. Harrison, D.J. Clark, J.I. Jang and M.G. Kanatzidis J. Am. Chem. Soc., 2012, 134, 20733−20744. “High-Performance Tellurium-Free Thermoelectrics: All-Scale Hierarchical Structuring of p-Type PbSe–MSe Systems (M=Ca, Sr, Ba)” Y. Lee, S.H. Lo, J. Androulakis, C.I Wu, L.D. Zhao, D.Y. Chung, T. P. Hogan, V.P. Dravid and M.G. Kanatzidis J. Am. Chem. Soc., 2013, 135, 5152–5160. “Tunable Biomimetic Chalcogels with Fe4S4 Cores and [SnnS2n+2]4–(n =1, 2, 4) Building Blocks for Solar Fuel Catalysis” Y. Shim, B.D. Yuhas, S.M. Dyar, A.L. Smeigh, A.P. Douvalis, M.R. Wasielewski and M.G. Kanatzidis J. Am. Chem. Soc., 2013, 135, 2330–2337. “Cs2MIIMIV3Q8 (Q = S, Se, Te): An Extensive Family of Layered Semiconductors with Diverse Band Gaps” C.D. Morris, H. Li, H. Jin, C.D. Malliakas, J.A. Peters, P.N. Trikalitis, A.J. Freeman, B.W. Wessels and M.G. Kanatzidis Chem. Mater., 2013, 25, 3344-3356.